Diamonds were and will always be amongst a woman's best friends, and she definitely knows that when it comes to a wedding ring that a diamond is embedded in it, size does matter. Whether to choose for a gold ring a diamond that weighs 1-carat or a diamond that weighs 2-carats? I believe that if for the same budget you need to choose between a white one-carat diamond that is highly cleaned and between a 2-carat diamond that is less sparkling and of a lower level of cleanness, then you rather prefer the one carat diamond. However, if your budget allows you to buy a 2 carat loose diamond of good quality, then the beauty of the ring that a two-carat diamond is embedded in it shall definitely substantially increase. What is the price of a c compared to a diamond that weighs 2 carats? For example, the price of a 1- carat high white colored diamond (for example the color F in the color scale that is customary in the industry), and of a VS1 level of cleanness, that is considered a good level of cleanness, costs USD 7,600. A 2 carat diamond with the identical attributes costs USD 30,000. This is in fact a very big difference. In this case I can advise and recommend purchasing the 2 carat diamond for a lower price, and when we shall set it in the ring it will be very impressive. I am adding 2 pictures of wedding rings, the first one with a 1-carat diamond compared to a wedding ring with a diamond that weighs 2 carats. How does a 2-carat diamond look compared to a diamond that weighs 1 carat? Although, the weight of the 2-carat diamond, is double than that of the 1-carat diamond, when you look at the ring that is embedded with the 2-carat diamond compared to a ring that is embedded with a 1-carat diamond, the 2-carat diamond does not seem double in size than the 1-carat diamond, but it definitely seems sparkling and much more impressive. The diameter of a well-done 2-carat diamond is 8.15 mm, while the diameter of a 1-carat diamond is 6.45 mm. Therefore, the diameter of the 2 carat diamond is larger than that of the 1 carat diamond by only 1.70 mm, and by all means, when you embed it in a ring the visual effect is very prominent. What is the difference between the surface areas of a 2-carat diamond compared to a 1-carat diamond? The surface area of a 2-carat diamond is 1.50 times larger than the surface area of a 1-carat diamond. 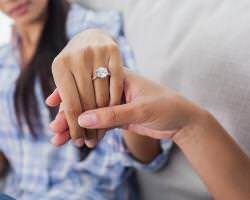 However, when a woman wears a wedding ring that is embedded with a 2 carat diamond, the people will see a flashing that is 50% bigger than that in the ring that is embedded with a 1 carat diamond. We invite you to enter our inventory that includes about 300 diamonds in different sizes and in excellent cutting and polishing levels.